Daniel Boulud, one of America’s leading chefs, has a bucketful of Michelin stars, countless awards, and owns a global network of restaurants—seven in New York alone. 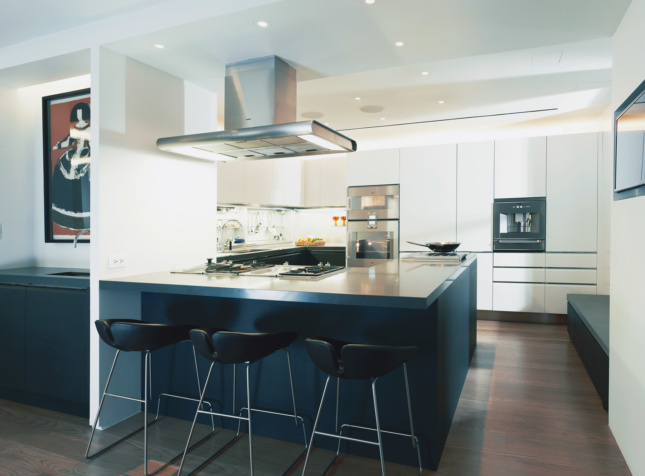 When he decided to renovate his apartment, a 2,500-square-foot flat atop his flagship restaurant, Daniel, at 65th and Park Ave., the redesign of the kitchen was a top priority. He entrusted the job to Stephanie Goto, an alumna of the offices of Rafael Viñoly and David Rockwell, who started her own firm in 2004. Goto, a devout foodie, collaborated with Tadao Ando on Japanese restaurant Morimoto in the Meatpacking District for her first gig. Through the years, she has added Corton and Aldea to her restaurant resume. “Before, it was a pass-through kitchen. It felt as if it was tucked into a closet,” Goto said. “It was so small that he stored bottled water in the oven.” The project, which took almost two years, was part of a larger life change: Boulud had just gone through a divorce. “Before, it was never about him; now it’s all about him. He used to go downstairs to work in the restaurant kitchen,” Goto said. The pair quickly decided on the functionality of an L shape. “Some counter space had to be sacrificed for the number of appliances that he had,” Goto said. But she managed to fit in everything. “Everywhere that there’s no appliance, there’s storage,” she said, adding that they had to take away part of the entrance hallway to push the wall out for additional space. 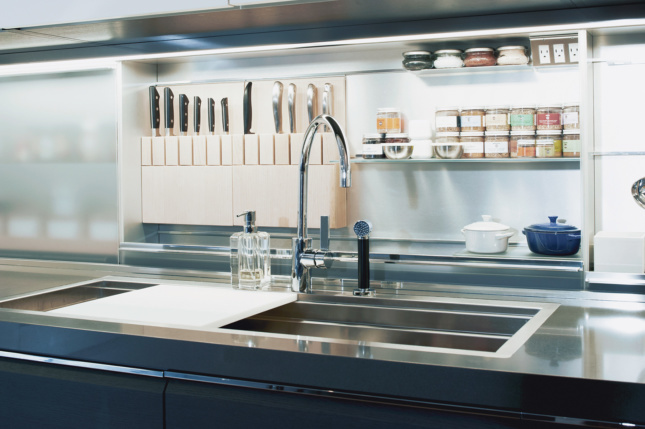 Dada’s Multitank three-foot long sink, with sliding cutting boards, is a Boulud favorite; the fittings are by Dornbracht. He keeps his most used cutlery (by Mac and Wüstof) at hand. Goto did a reconnaissance of appliances and cabinetry resources and then brought Boulud in to make the final selections. For cabinetry, they chose Dada’s Trim by Dante Bonuccelli because they liked its versatility as well as the Italian company’s willingness to customize. “We convinced them to create a secret knife drawer under the range that was just two inches deep,” she said. The result is no ordinary home kitchen. The sink is extra large—3 ½ feet long and 16 inches wide—with sliding insets and a cutting board. The room is filled with specialty appliances like a plancha, a stainless-steel plate that is widely used by chefs. There is also a lava stone grill, an induction cooker, and a coffee machine with a warming stand. 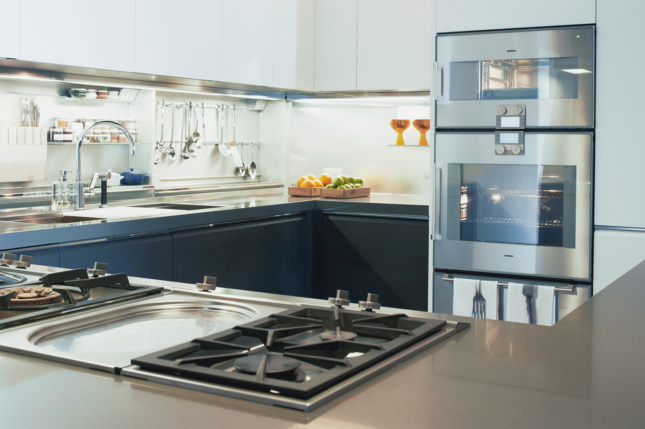 His cooktop and ovens are from Gaggenau, a longtime favorite for European chefs. Goto also had to deal with his vast collection of cutlery.